An irruption is a dramatic, irregular migration of large numbers of birds to areas where they aren’t typically found, possibly at a great distance from their normal ranges. Perhaps the best known irruptions are the irregular appearances of Snowy Owls in the northerly parts of the midwest. Typically, a irruption of birds involves a failure of a food resource in the normal range. The birds have been reported along the southerly slopes of the hills north of town, in the parking lot of the Noel Wien Library, along Chena Ridge and in Pioneer Park. A review of Christmas Bird Counts the last few decades reports perhaps one Sharp-tailed every five to six years. There are anecdotal reports of more birds but, on the dates when everyone is out looking for birds, they aren’t at all common. Yet this year there are lots of reports and even, as you see here, photos. This bird was one in a flock of 6 – 8 birds. 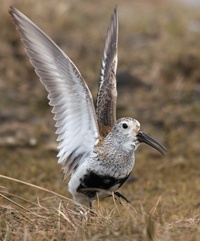 Food-driven irruptions occur when a fluctuating food source – tundra voles, in the case of Snowy Owls, or spruce cones in the case of White-winged Crossbills – reach a low point, and large numbers of birds move to a different territory looking for food. It’s different than seasonal migration, which happens every year. Or if there is a population surge, younger birds may be driven out of their natal territories. Sharp-tailed Grouse don’t seem to fit any of these patterns. 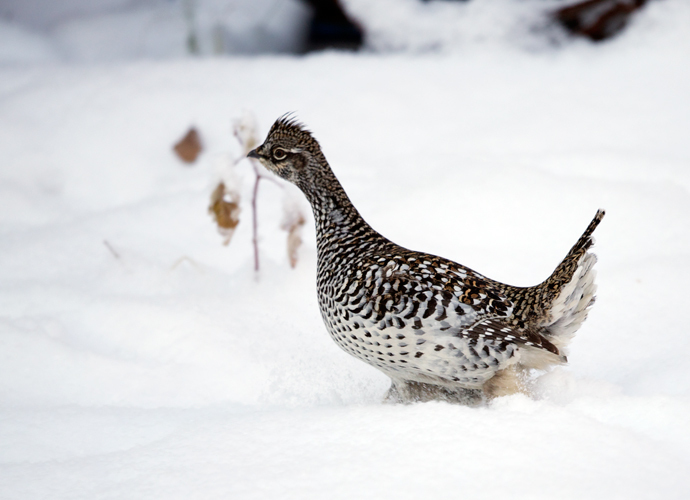 There’s a lot about the boreal forest birds that’s not well understood by science. Sure, you don’t have to know why to enjoy the treat of an uncommon bird, but it does add to the pleasure. The snow geese have arrived for the winter. I consider that the official first day of winter.